And another item on the bucket list gets ticked, though whether or not a mere 6km segment of a half marathon counts is a moot point. But moot or not, today was great fun. Not great running but great fun, and we always knew that would be the case. When you enter a race category which has a reported 18,000+ participants, there is obviously going to be precious little space to run, and that was indeed the case at first, with many, many corporate groups with banners and flags and matching baseball caps and all the attendant hoopla. I have the sneaky feeling that a lot of all this corporate participation is to tick the CSR box, but maybe I am being unduly harsh. As it was, many of these good folk did, as I had been told, peel off within the first kilometre – some of them way, way before that. But even so, the road was crowded, people ambled along, they stopped to buy peanuts, or an ice-cream, they stopped to listen to music, they stopped to take a zillion selfies – and we nerdy runners of our brilliant Couch to 6 km group were eager-beaver-ly wending our way through the throng, trying to run, dammit. I had great fun, but the organisation was pretty shambolic. Instead of having staggered departures, all 18000+ of us set off together, which meant lots of pushing and shoving as we all tried to get down one corridor towards the official start line. Not that I ever actually saw the start line, as we were pushed along by the crowd, me holding tightly onto the hand of the youngest member of our team, 13 year old Shaivi. I was terrified of losing her in the crowd, but we held hands for lots of the time, and ran together, and finished together, the oldest and youngest member of our team, which had a nice symmetry to it. 1) Well, the sheer buzz and noise and energy at the Jawarharlal Stadium were pretty amazing. 2) We ran past the Sai Baba temple, where there are always cripples and beggars outside. Always. There was a poor man sitting on the kerbside, no legs (one was non-existent and the other was a withered, mutilated stump) and there he was with his smartphone filming us as we ran past. 3) As Shaivi and I crossed the finishing line, there was definitely a great sense of achievement. Not for the 6km covered, since we run more than that at our Jahapanah training sessions, but the fact that for the first time I ran 5.9km non-stop. We reckon that we both slowed down to a brisk walk 2x 50 metres, tops, so despite the crowded conditions, I ran better than ever before. We gave each other a sweaty hug and then went to find our post-race snack – an apple and a packet of biscuits. And the bucket list got another tick. 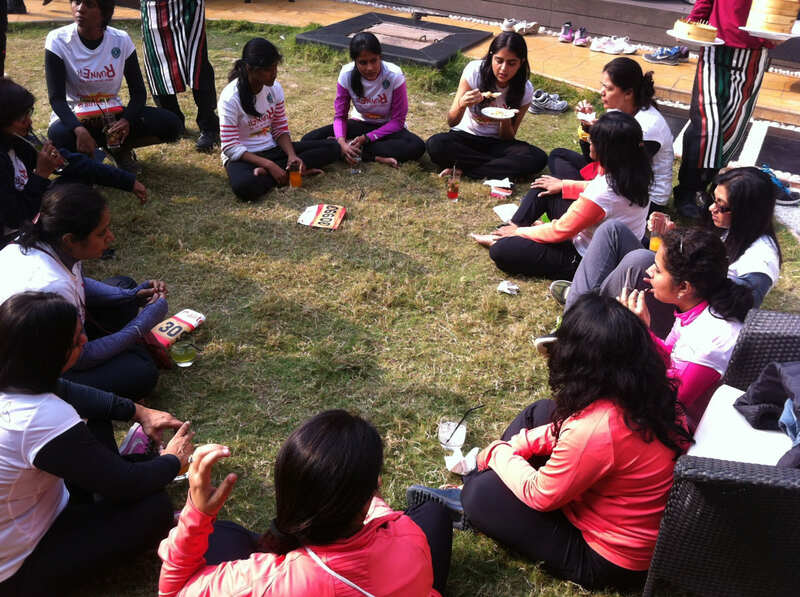 After the race we were treated to a fab lunch by our sponsors at the Ashoka, where we sat on the grass and laughed and wolfed down vast quantities of food. We were also treated to a hand massage. Doc, our fearless leader, being pampered. And we are now all gunning for a 10km, and meeting next weekend to continue training. Sunday, the day after tomorrow, it is the Airtel Delhi Half Marathon and I will be part of it. And it’s all hugely exciting. For the last – what? 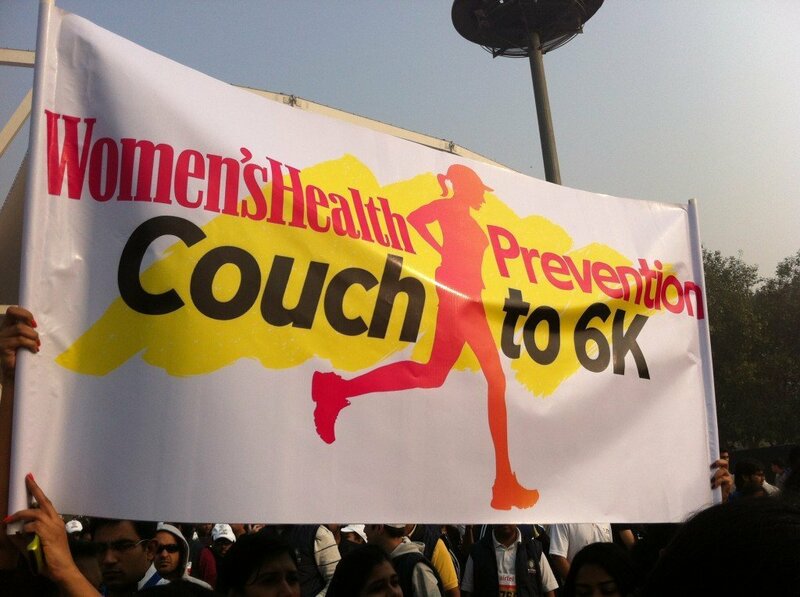 – 3 months I have been part of a programme called Couch – 6km, intended to get non-runners running. Which is exactly what we are doing. 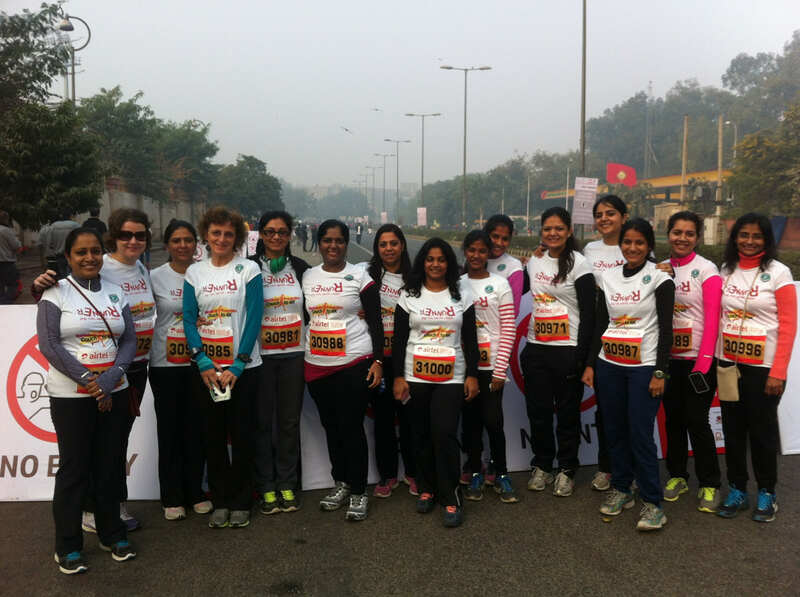 From a group of women who were not runners in any sense of the word, we are all running as a team in the Great Delhi Run on Sunday – a section of the marathon. It’s all been huge fun, and the sense of camaraderie from these young women is amazing. 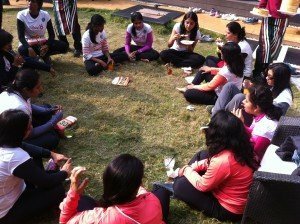 We whatsapp each other, we Facebook, we have post-training-run breakfasts, we have plans to run a 10km next year – to say we are all motivated is an understatement. Tomorrow we will have our last early morning practice session together, and get our bibs and Team Couch – 6km T shirts, and work out the logistics for Sunday. Heady stuff for someone like yours truly who thought running was a thing of the past due to aging knees. I’ve never raced remotely competitively, so am looking forward hugely to Sunday, though with some 18,000 people taking part in the Great Delhi Run, I’m not sure how much actual running we will get in. More like shuffling, I fear. Whatever happens on Sunday, through this new-found love of running, I have made some lovely new friends and discovered new bits of Delhi.